Having now retired from the ministry, and having no way by which to sustain his family, besides his own industry, he was [necessitated] to find other employment in order to provide for his maintenance, and for this purpose he engaged in the humble capacity of a journeyman tanner, in that city, and followed his new employment, without murmuring, for two years - during which time he both saw and experienced, that, by resigning his pastorial vocations in that city, and engaging in the humble occupation of a tanner, he had lost many who once professed the greatest friendship, and who manifested the greatest love for his society - that when he was seen by them in the garb suited to the employment of a tanner, there was no longer that freedom, courtesy and friendship manifested - that many of his former friends became estranged and looked upon him with coolness and indifference - too obvious to admit of deception. To a well regulated and enlightened mind - to one who soars above the arbitrary and vain lines of distinction which pride or envy may draw, such conduct appears ridiculous - while at the same time it cannot but cause feelings of a peculiar nature, in those who, for their honesty and integrity of heart, have brought themselves into situations to be made the subjects of it. Exactly how it was that he came to be employed as a humble tanner, Elder Rigdon does not reveal. Leather tanning then was a specialized trade which took a young apprentice about 3 or 4 years' training to properly learn. Only after his completion of such a term of service and study could a leather-maker of the early 1800s honestly claim the title and credentials of a "journeyman tanner." Neither does history record how it was that Sidney Rigdon became advanced so far in the leather tanning trade, as to gain the reputation locally as a "currier." However, he was known have supplied the thin, supple and highly polished sheets of leather then used in the manufacture of book bindings, harness straps and wallets. In a c. 1900 account, Sidney's son, John W. Rigdon, mentioned that his father formed a partnership with Richard S. Brooks to open the short-lived tannery. John calls this same Richard (who was Rigdon's brother-in-law) a corroyeur, so it seems likely that Sidney improved upon his previous, undocumented tanning training, to become a leather dresser (currier) as well as a leather maker. When the business was dissolved in 1825, Sidney's partner at that time was Richard's brother, William S. Brooks. 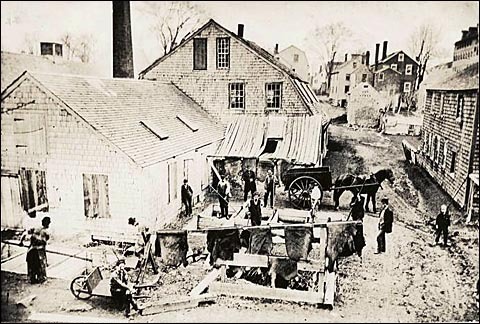 All of Sidney Rigdon's Brooks family brothers-in-law probably had some amount of training in the trade, as their father, Jeremiah Brooks, owned and operated a tannery near Warren, Ohio. Sidney is supposed to have solemnized the marriage of one of the Brooks brothers (Jeremiah, Jr.) at Canonsburg, in Washington County, in 1821. The 1820 Census tabulation shows a William Brooks living just across the Washington/Allegheny county line in Findley township (about halfway between Canonsburg and Pittsburgh), so it is possible that all three Brooks brothers came to the Pittsburgh area at about the same time as Sidney Rigdon took up his duties as pastor of the First Baptist Church in Pittsburgh, and that Richard and William were, respectively, partners with him in the tannery after Sidney lost his ministerial position. Of the three brothers, only Jeremiah Brooks, Jr. is known to have remained in the area; he was a well known Pittsburgh physician. 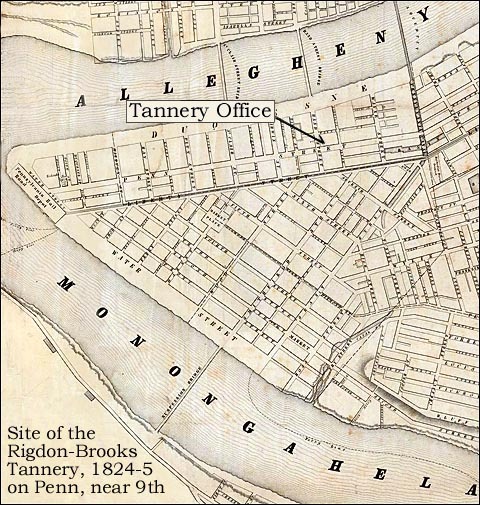 The Rigdon-Brooks tannery was located on a lot that ran along the north side of Penn Ave. (then Penn St.), paralleling the Allegheny River. The tannery office evidently sat in the southwest corner of the lot, a couple of buildings east of the intersection of Penn with Hand (now 9th Street, which extends across the Allegheny on the bridge to the north). Why the business was broken up and sold, neither Sidney Rigdon nor his contemporaries every bothered to relate, but perhaps it did not generate sufficent income for its owners and they subsequently found other lines of employment. It appears that Sidney Rigdon found at least some part-time employment as a journeyman tanner and leather finisher, after he had moved to Bainbridge township, Geauga County, Ohio at the end of 1825. At least he paid some of his grocery bills with finished leather goods. A few years later, after Sidney had joined the Mormons and relocated to Kirtland, he became the owner of the tannery in that place. It is doubtful, however, that the proud Latter Day Saint leader ever donned his old leather-maker's smock and cap, and again dipped sheepskins in the malodorous chemical vats. Only in his twilight years, after leaving the Mormons was the old man forced by economic necessity to play his old currier's tradmanship, and then in the cleaner and more comfortable work of dressing cloth instead of leather. ...the question that pressed most heavily was that regarding the support of Bishop Rigdon, He was good for nothing in the line of handicraft; having been brought up at the most slipshod style of farming, he was not sufficiently educated to take a hand in the school even if a place had been open there, Nevertheless his situation was somewhat relieved by the sale to James (Means) on the 28th of June 1823, of the share of the paternal estate in St. Clair township that fell to his portion (Patterson, p.9), and there was a brief season of respite that could be employed in looking for a situation, After due consideration he decided to resort to a tannery. This point is established on the authority of Joseph Smith, who must have been in possession of definite information. In his biography of Rigdon, which there is reason to suspect was based upon a brief inquiry and investigation at first hands, Mr. Smith declares: "Having retired from the ministry, Mr. Rigdon engaged as a day laborer in a tannery, which employment he followed for two years, after which he removed to Bainbridge (township), Geauga county, Ohio" (Tullidge, p. 102). This view is confirmed by the authority of Patterson (p. 8); by the testimony of an eye witness in the person of Mrs. Eichbaum (Patterson, p. 11) and by Rigdon's family, who are uniform in the denial that he was ever at any time employed in a printing-office (Patterson, p. 9). A still further indication of the correctness of it appears in the circumstance that when on the 25th of April 1834, the prophet was dividing out such property as he had been enabled to lay his hands upon in the village of Kirtland, the tannery was accorded to Sidney. Following are the exact words of the revelation in question: "Let my servant Pelagoram (Sidney Rigdon) have appointed unto him the place where he now resides, and the lot of Tahhanes (the tannery) for his stewardship, for his support while he is laboring in my vineyard, even as I will when I shall command him (D&C 104:20). Sidney being acquainted with the art of tanning, was an appropriate person to whose keeping and stewardship this establishment might be safely entrusted. She [Mrs. Eichbaum] is one of the main witnesses to the indubitable fact that while a resident of Pittsburgh, Sidney was engaged in a tannery. Besides these functions he [Sidney Rigdon] also secured a position of labor in a tannery. Note: See By William S. West's 1837 booklet A Few Interesting Facts Respecting The Rise and Progress and Pretentions of the Mormons, for an early identification of the D&C's "Pelagoram" as Sidney Rigdon, and of its "Tahhanes" as the Kirtland Tannery. There was disagreement between Sidney Rigdon my father & an old Scotch Divine & at length the church seemed about to divide over it. My father tendered his resignation & the church got another minister. He remained in Pittsburg about 2 years. This happened about Aug. 1824 and he entered the tanning business with his brother-in-law, Richard Brooks a couryer by trade. My father put some money in the business. At the end of 2 years they sold the tannery. Note: In his transcription of another copy of John W. Rigdon's lecture, Keller quotes this same recollection thusly: "After resigning the pastorship of the Baptist church, he [Sidney Rigdon] remained in Pittsburg about two years. After that [he worked] in a tan yard with his brother-in-law, Richard Brooks, who was a tanner and conyer [?] by trade who started a tannery in Pittsburg. My father contributed some money to the business. At the end of two years they sold the tannery." John W. Rigdon, in his lecture, perhaps used the European pronuncion of the leather currier occupation, which would be rendered as corroyeur; however, his spelling of the word as "couryer," was obviously not understood by Keller. (See Karl Keller. "I Never Knew a time when I did not know Joseph Smith": A Son's Record of the Life and Testimony of Sidney Rigdon, in: Dialogue: A Journal of Mormon Thought I:4, Winter 1996, pp. 15-42). I knew and distinctly remember Robert and Joseph Patterson, J. Harrison Lambdin, Silas Engles, and Sidney Rigdon.... I do not know what position, if any, Rigdon filled in Patterson's store or printing-office... He was connected with the tannery before he became a preacher, though he may have continued the business whilst preaching. Note: Mrs. Eichbaum's recollection -- that Rigdon was involved in the leather tanning business "before he became a preacher," stands at odds with Richard S. Van Wagonor's conclusion, that "Rigdon apprenticed under his brother-in-law, Richard Brooks" in the tanning business at Pittsburgh, c. 1824-25. Rigdon turned 30 at the beginning of 1823 and was nearing the age of 31, when he entered into the management of a tanning yard and tanning office in Pittsburgh, with one or more of his Brooks family brother-in-laws. It is difficult to believe that a man of that age would be accepted by any master tanner as an apprentice -- and more difficult still, to believe that such an "apprentice" might produce a remunerative output in saleable leather products in such a short period of time. Van Wagoner provides no support for his assertion regarding Sideny Rigdon's supposed 1824-25 "apprenticeship;" nor does he attempt to reconcile such a supposition with Rigdon's own statement, that he then worked as a "journeyman tanner." Rigdon's earlier biographer, from whom Van Wagoner may have derived his suppositions in this matter, merely says that Rigdon "had served an apprenticeship that way [in the tannining trade] at Pittsburgh," without providing any chronological point of reference. In his 1886 editorial remarks on Sidney Rigdon's occupation, Whitsitt says that Rigdon, after the beginning of 1823, was "somewhat later a tanner" but this evidently was simply hsi repetition of Rigdon's own statement, that he then worked as a "journeyman tanner." "... [Spalding's manuscript] sold to Mr. Rigdon for a mere song at the bankruptcy of Butler & Lambdin on the 1st of January 1823. Rigdon was at that time pastor of the Baptist Church, and somewhat later a tanner. He was never at any time a printer." A "currier" of those days prepared leather for special use by treating the rawhide with certain chemicals, trimming it to a uniform thickness, and polishing its outer surface. One such special use would have been the manufacture of leather sheets for book-binding. An example of the early need for curriers in Pittsburgh may be seen in an advertisement in the Mercury for May 20, 1813, reading: "Wanted immediately -- A tanner and currier -- apply at the office of the Mercury." The same paper advertised for "journeyman book-binders" in its issue of Aug. 10, 1814, requesting respondents to apply to "R. and J. Patterson." Exactly when and where Sidney Rigdon received his initial training in the tanning business is unknown. If he worked off and on as a tanning shop apprentice in the years prior to 1817, that might help explain how he so easily became an experienced "journeyman tanner" in Pittsburgh during the mid 1820s. Rigdon's presumed "connection" with the Pattersons, Engles, and Lambdin may thus have been based upon nothing more formal than his occasional sales of book-bindings to that set of men, sales which may have begun in the years before 1817. Some researchers have speculated that Sidney Rigdon, who later became a journeyman tanner, also had some personal acquaintance with the leather book-binding industry in Pittsburgh. See, for example, the letter published in 1879 in which old Pittsburgh resident recalled, "So far back as 1822 the firm of Patterson & Lambdin... did business as Publishers... [in Pittsburgh] At the same time Sidney Rigdon, tanner and currier, had his tan-yard... it is likely that, in the business transactions between book-binder and tanner, Sidney Rigdon took the Spaulding manuscript." This information agrees with the findings of Isaac Craig, who researched Sidney Rigdon's early years and reported that Rigdon once "had a small tannery... [in Pittsburgh] for the manufacture of book-binders sheep-skins." Later in life, Sidney Rigdon worked for a while as a cloth dresser, yet another occupation which contributes directly to the manufacture of certain kinds of book bindings. Note 2: The... correspondent provides valuable information, saying that "Sidney Rigdon, tanner and currier, had his tan-yard and shop on Penn street." A "currier" of those days prepared leather for special use by treating the rawhide with certain chemicals, trimming it to a uniform thickness, and polishing its outer surface. One such special use would have been the manufacture of leather sheets for book-binding. 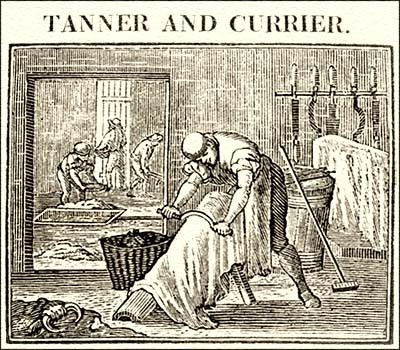 An example of the early need for curriers in Pittsburgh may be seen in an advertisement in the Mercury for May 20, 1813, reading: "Wanted immediately -- A tanner and currier -- apply at the office of the Mercury." The same paper advertised for "journeyman book-binders" in its issue of Aug. 10, 1814, requesting respondents to apply to "R. and J. Patterson." Note 3: The second correspondent also says, "it is likely that, in the business transactions between book-binder and tanner, Sidney Rigdon took the Spaulding manuscript..." Sidney Rigdon, after he was removed by the orthodox Baptists of Pittsburgh, preached Campbellite doctrines to a small band of seceders at the court house in that city. At some point became a "journeyman tanner" in the Pittsburgh area and was able to work at that occupation after his dismissal from the regular Baptists. Rebecca J. Eichbaum, w ho knew Rigdon at Pittsburgh, in her 1879 statement, says: "He was connected with the tannery before he became a preacher, though he may have continued the business whilst preaching. Rebecca's statement is confirmed by Rigdon's own 1843 autobiographical sketch, where he states: "Having now retired from the ministry, and having no way by which to sustain his family, besides his own industry, he was necessiated to find other employment in order to provide for his maintenance, and for this purpose he engaged in the humble capacity of a journeyman tanner, in that city, and followed his new employment, without murmuring, for two years." Of course Rev. Rigdon could not have gone to work as a "journeyman" tanner without first having earlier served an apprenticeship in that same trade. Note 4: As a "currier," Rigdon would have had personal acquaintance with the leather book-binding industry in Pittsburgh. The main questions to be answered are when and where Rigdon first worked as a currier and when Robert & Joseph Patterson (and/or their business associate Jonathan Harrison Lambdin) were first engaged in the book-binding trade in Pittsburgh. For more discussion on this point see the notes accompanying the ad for "tanning and currying" in the Mercury of Nov. 20, 1822. It may be relevant, that in his 1842 interview with Robert Patterson, Sr., LDS Apostle John E. Page was reportedly told that "Sidney Rigdon was not connected with the office" maintained by Patterson for book publishing in Pittsburgh, until "several years" after Solomon Spalding's 1816 death. A likely period for this "connection" would have been in 1824, when Rigdon was a tanner and currier in Pittsburgh and Jonathan Harrison Lambdin was acting on his own as a sales agent for "the Assignees of R. Patterson & Lambdin," in the remaining business of this previously dissolved partnership. The indifference of his former associates struck at the core of Rigdon's self-esteem. That it seared his soul is apparent from his recollections fifteen years later. "To a well regulated and enlightened mind," he began, "to one who soars above the arbitrary and vain lines of distinction which pride or envy may draw, such conduct appears ridiculous -- while at the same time it cannot but cause feelings of a peculiar nature, in those, who for their honesty and integrity of heart, have brought themselves into situations to be made the subjects of it." Despite friends' reactions, he did not veer from his purpose. "He had counted the cost before his separation," he explained, "and had made his mind known to his wife, who cheerfully shared his sorrow and humiliation, believing that all things would work together for their good, being conscious that what they had done was for conscience sake, and in the fear of the Lord." [045 Ibid. Although not true, Eber Howe affirmed that "Rigdon resided in Pittsburgh about three years, and during the whole of that time, as he has since frequently asserted, abandoned preaching and all other employment for the purpose of studying the bible" (Mormonism Unvailed [Painesville, OH: E. D. Howe, 1834], 289)]. As his father before him, Rigdon spent his early life on the farm and did some farming of his own. However, it was thought that he felt farming was somehow beneath his dignity (according to his neighbor, Isaac King) and he left the occupation quickly.